Welcome to the home base of science writer Brian Switek. Here you'll find details about his books, his latest articles and videos, and where you can see him enthusing about natural history live. Go ahead. Dig in! Bone is a marvel, an adaptable and resilient building material developed over 500 million years of evolutionary history. It gives our bodies their shapes and the ability to move. It grows and changes with us, an undeniable document of who we are and how we lived. Arguably, no other part of the human anatomy has such rich scientific and cultural significance, both brimming with life and a potent symbol of death. Brian Switek is a charming and enthusiastic osteological raconteur. In this natural and cultural history of bone, he explains where our skeletons came from, what they do inside us, and what others can learn about us when these wondrous assemblies of mineral and protein are all we’ve left behind. Bone is as embedded in our culture as it is in our bodies. Our species has made instruments and jewelry from bone, treated the dead like collectors’ items, put our faith in skull bumps as guides to human behavior, and arranged skeletons into macabre tributes to the afterlife. Switek makes a compelling case for getting better acquainted with our skeletons, in all their surprising roles. 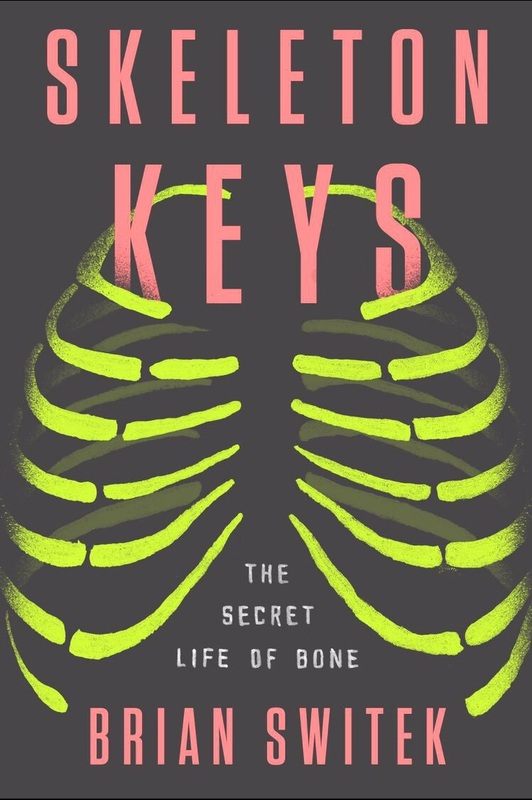 Bridging the worlds of paleontology, anthropology, medicine, and forensics, Skeleton Keys illuminates the complex life of bones inside our bodies and out. You can purchase Skeleton Keys here. Discover the most dangerous carnivores that ever roamed the Earth in this exciting and action-packed exploration of Prehistoric Predators, featuring a unique cover that feels like dinosaur-skin! The biggest baddies of the prehistoric world -- the carnivores -- come alive in Prehistoric Predators. From favorites like T-Rex and Giganotosaurus, to the ferocious Spinosaurus and terrifying Megalodon, the stunning full-color illustrations from renowned paleoartist Julius Csotonyi make these dangerous creatures spring to life on each page. Bursting with fascinating facts, dynamic artwork, and a unique dino-skin textured cover, this is the perfect book for dinosaur lovers of every age! Prehistoric Predators is available for pre-order. Written by Brian Switek, this National Geographic magazine special issue introduces readers to the creatures of the Mesozoic era, denizens of enormous size and ferociousness that reigned over land, sea, and sky roughly 252 to 66 million years ago. The Mesozoic earth was very different from the world we know—a hot planet with a single giant continent that eventually broke apart, forming separate land and warm shallow seas. On this slowly shifting stage, a cast of giants arose, dominating every imaginable niche. Chronicling the three periods of the Mesozoic—Triassic, Jurassic, and Cretaceous—When Dinosaurs Ruled answers questions like what is a dinosaur, and who are our current world descendants of these long lost creatures? You can purchase When Dinosaurs Ruled here. Dinosaurs, with their awe-inspiring size, terrifying claws and teeth, and otherworldly abilities, occupy a sacred place in our childhoods. They loom over museum halls, thunder through movies, and are a fundamental part of our collective imagination. In My Beloved Brontosaurus, the dinosaur fanatic Brian Switek enriches the childlike sense of wonder these amazing creatures instill in us. Investigating the latest discoveries in paleontology, he breathes new life into old bones. With infectious enthusiasm, Switek questions what we’ve long held to be true about these beasts, weaving in stories from his obsession with dinosaurs, which started when he was just knee-high to a Stegosaurus. Endearing, surprising, and essential to our understanding of our own history. You can purchase My Beloved Brontosaurus here. When Charles Darwin unveiled his revolutionary idea that life had evolved by means of natural selection it made sense of the whole of biology, yet it was dogged by a major problem: the transitional fossils that would confirm Darwin’s predictions were seemingly nowhere to be found. The absence of these “missing links” became one of the most hotly debated issues in evolutionary science. Only now—through advances in paleontology, molecular biology, and genetics—can the comprehensive story be told. Written in Stone is the first popular account of the remarkable discovery of these fossils (from walking whales to feathered dinosaurs and hominins of all types), the debates they engender, and how today’s discoveries have changed our perspective of the tree of life. By combining the most up-to-date scientific research with the history of science, Written in Stone explores our changing ideas about our place in nature and celebrates the remarkable variety of life on Earth. You can purchase Written in Stone here.